With the World Cup upon us again we can perhaps look forward to yet another heroic defeat on penalties by England. England are in fact the worst country of any of the major footballing nations at taking penalties, having won only 1 out of 7 shoot-outs at the Euros and World Cup. In fact of the 35 penalties taken in shoot-outs England have missed 12 – which is a miss rate of over 30%. Germany by comparison have won 5 out of 7 – and have a miss rate of only 15%. A different study which looked at 286 penalties from both domestic leagues and international competitions found that goalkeepers are actually best advised to stay in the centre of the goal rather than diving to one side. This had quite a significant affect on their ability to save the penalties – increasing the likelihood from around 13% to 33%. So, why don’t more goalkeepers stay still? Well, again this might come down to psychology – a diving save looks more dramatic and showcases the goalkeeper’s skill more than standing stationary in the centre. 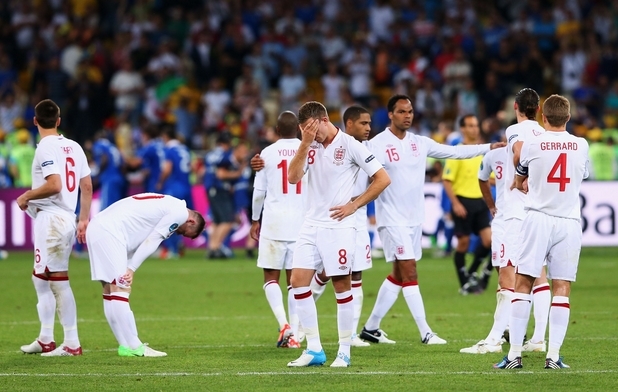 So, why do England always lose on penalties? There are some interesting psychological studies which suggest that England suffer more than other teams because English players are inhibited by their high public status (in other words, there is more pressure on them to perform – and hence that pressure is harder to deal with). One such study noted that the best penalty takers are the ones who compose themselves prior to the penalty. England’s players start to run to the ball only 0.2 seconds after the referee has blown – making them much less composed than other teams. However, I think you can put too much analysis on psychology – the answer is probably simpler – that other teams beat England because they have technically better players. English footballing culture revolves much less around technical skill than elsewhere in Europe and South America – and when it comes to the penalty shoot-outs this has a dramatic effect. As we can see from the statistics, players who are technically gifted enough to lift their shots into the top corners give the goalkeepers virtually no chance of saving them. England’s less technically gifted players have to rely on hitting it hard and low to the corner – which gives the goalkeeper a much higher percentage chance of saving them.